Please Take Note: This is a review of the final game, but it might change slightly based on the success of the Kickstarter campaign. 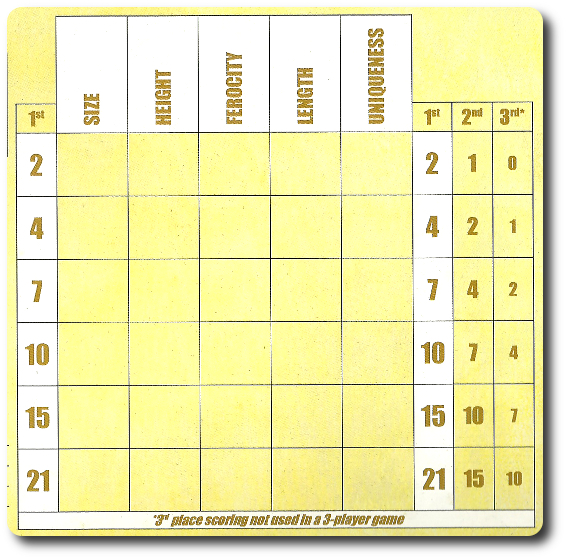 The game is being reviewed on the components and the rules provided with the understanding that “what you see is not what you might get” when the game is published. If you like what you read and want to learn more, we encourage you to visit the game publisher’s website. Now that we have all that disclaimer junk out of the way, on with the review. The Bone Wars (1877 to 1892), also known as “The Great Dinosaur Rush”, was an intense period of scientific prehistoric discovery and bitter rivalry between Othniel Charles Marsh and Edward Drinker Cope. In addition to digging up many bones, many were also destroyed. Theft and bribery were common. Time to join the rush! The Great Dinosaur Rush, designed by Scott Almes and to be published by APE Games, will reportedly be comprised of 1 Dinosaur Bones bag, 210 Dinosaur Bone pieces (60 green “Body” and “Head” pieces; 50 red “Leg” and “Arm” pieces; 50 yellow “Neck” and “Tail” pieces; 30 blue “Unique Feature” pieces; and 20 grey “Wild” pieces), 1 game board, 21 Bonus cards, 5 Player screens, 5 Player Reference boards, 5 Score tokens, 5 Player pawns, 6 Promotion cubes (black), and 45 Notoriety tokens. As this is a review of a prepublished game, I cannot comment on the game component quality. Second, give each player 1 Player Screen and 1 Player pawn of the player’s choice. Give each player 1 Player Reference board, as well, and have them place the Player Reference board in front of them so the normal side is facing up (family game variant should be placed face-down). The Player Screen is not used until later in the game. Third, place 1 Score marker on each Player’s color on the scoring track found on the game board and place 1 black Promotion cube in the first row of each of the Museum Categories, as well as the “Round 1” spot. Fourth, shuffle and place the Notoriety tokens in a pile, face-down. The number values should not be showing. The pile can be placed to one side of the game board. Fifth, shuffle and deal each player 2 Bonus cards. Place the rest of the Bonus cards face-down and to one side of the game board. Sixth, give each player 2 red Dinosaur Bones, 3 green Dinosaur Bones, and 2 yellow Dinosaur Bones. This is the player’s initial dinosaur skeleton. Throughout the course of the game, players will use and lose Dinosaur Bones. However, a player can never have any less than their starting Dinosaur Bone collection. Place the rest of the Dinosaur Bones in the bag. Seventh, randomly draw 3 Dinosaur Bones and place them in one of the spaces in the “Badlands” found on the game board. Repeat this step for each empty space in the “Badlands”. If playing with 4 or 5 players, add Dinosaur Bones to the green spaces and add Dinosaur Bones to the red spaces if playing with 5 players. Never add Dinosaur Bones to the dark grey spaces. Eighth, determine who the first player will be for the first round of game play. The player to the right (counter-clockwise) of the first player places their Player pawn on any available Player pawn space bordering the “Badlands”. Continue to add pawns in counter-clockwise turn order resulting in the first player of the round adding their Player pawn last. That’s it for game set up. Time to get digging! The Great Dinosaur Rush is played in rounds and turns for a total of 3 rounds per game. 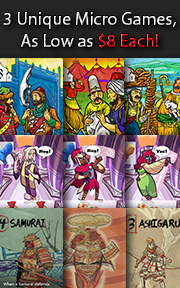 Each round has several phases in which all the players participate in turn order sequence. The Field phase focuses on collecting Dinosaur Bones and making things difficult for opponents. The first player for the first round is selected either at random or by vote. During the second and third rounds, the first player is the player who currently has the most points. Starting with the first player and continuing clockwise, the following steps are taken. Note: The “Badlands” are populated with Dinosaur Bones as part of the game set up. During rounds 2 and rounds 3, repopulate the “Badlands” with bones before the first player takes their turn. Only those spaces not currently occupied by a player’s Player pawn are given new Dinosaur Bones. Before round 2, add 2 Dinosaur Bones to the “Badlands” spaces. Before round 3, add 1 Dinosaur Bone” to the “Badlands” spaces. Any Dinosaur Bones located in the same space as the player’s Player pawn are collected and added to the player’s Dinosaur Bone pile. Spaces are referred to as “dig sites”. Player pawns must move and can only move in a straight line (not turning or shifting direction). However, the player decides how many spaces the Player pawn moves, giving them a certain amount of control regarding where they land. Player pawns can move through an opponent’s Player pawn, but cannot stop and share the same space. Players can not move their Player pawn through the dark grey spaces, which are considered to be “Mountains”. The player can now increase (move up) or decrease (move down) a Promotion cube on one Museum Category of their choice. The Museum Categories are “Size”, “Length”, “Height”, “Ferocity” and “Uniqueness”. These are not just random categories. These are used to award the player points based on the dinosaur they construct. Players should consider this portion carefully, making Museum Categories worth more points if they think they can win and making the others worth fewer points if they think their opponents will win. The player can now take one action. There are two different types of actions. The first is referred to as “Standard” and represents the types of actions you’d expect a well-respected scientist to take. The other is referred to as “Notoriety” and these actions represent the ugly underbelly of the feud between the scientists. Each action is summarized here. 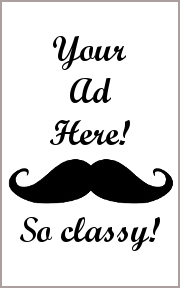 Publicize: this action allows the player to have another chance of adjusting the Museum Categories, as described in the Publicize step above. Donate: this action allows the player to turn in 1 to 3 Dinosaur Bones, placing them back in the bag. The player can then decide to add a number of points to their score equal to the number of Dinosaur Bones donated or remove 1 Notoriety token with a value equal to the number Dinosaur Bones donated. Publish: this action allows the player to draw 1 Bonus card. If there are no more Bonus cards to be drawn, this action cannot be taken. 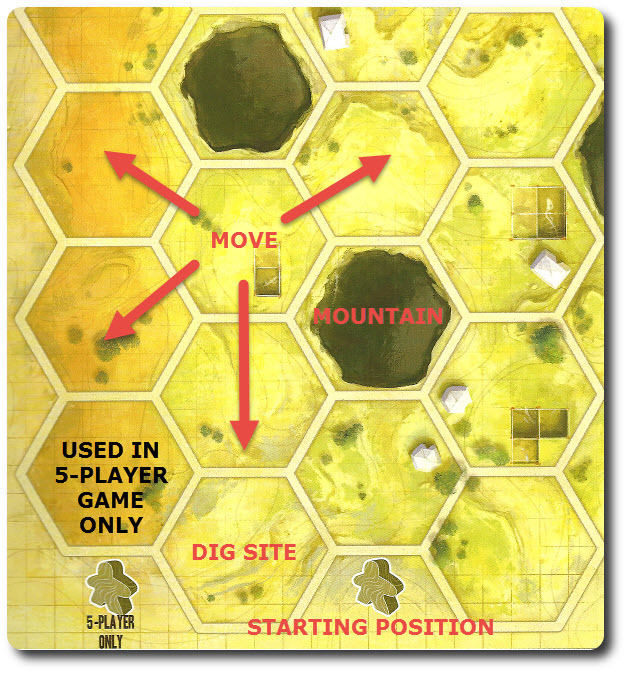 Sabotage: this action allows the player to draw 2 Notoriety tokens, randomly placing 1 face-down next to an adjacent space in the “Badlands” and keeping the other. If any player ever crosses over or ends their turn in the space with the Notoriety token, they take it as their own. Dynamite: this action allows the player to draw 3 Dinosaur Bones from the bag, adding them to their Dinosaur Bone pile. Any Dinosaur Bones in the space are blown up and returned to the Dinosaur Bone bag. Steal: this action allows the player to take 1 unclaimed Dinosaur Bone from an adjacent space in the “Badlands”. The adjacent space can be occupied by an opponent. After each player has taken their turn, any Dinosaur Bones in the same space as their Player pawn are now collected and added to the player’s Dinosaur Bone pile. This phase is now over. Phase 2: Build Those Bones! This phase is all about creativity. Players will be tasked to use their Dinosaur Bones to create a dinosaur skeleton. How and what the skeleton looks like will be up to the player, but everyone must use a few simple rules. When building the dinosaur skeletons, players should keep in mind what the Museum Category values are, as these will be used to score the dinosaur skeletons in the next phase of the game. All players now use their Player Screens and build their dinosaur skeletons behind it. An example dinosaur skeleton is provided, but players can create whatever they like given the following restrictions. Refer to the following dinosaur skeleton key to help identify the bone types, but do not consider the following skeleton as the example to follow. Ribs (A) and Spines (B) are made of green Dinosaur Bones. The Spine is used to connect the Neck and Tail and must be comprised of 1 Dinosaur Bone piece. The Ribs connect to the Spine and must be comprised of at least 1 Dinosaur bone, as well. The Head (D) is made of green Dinosaur Bones and must be a continues grouping with at least 1 Dinosaur Bone connecting to the Neck. The Tail (E) is made of yellow Dinosaur Bones and must connect to the Spine. 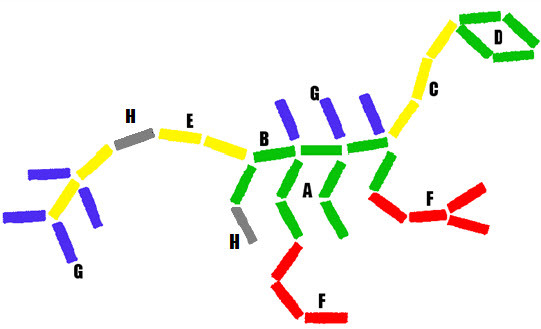 The Tail cannot “branch” (must remain a single line of pieces). The Limbs (F) are made of red Dinosaur Bones and used to create the dinosaur’s arms, hands, legs, and feet. The dinosaur skeleton must have feet and hands and both Limbs cannot touch each other. Limbs can be connected anywhere on the dinosaur skeleton. Unique bones (G) are made of blue Dinosaur Bones and they are used to add fins, spines, wings, and anything else the player can imagine. They can be placed anywhere on the outside of the dinosaur skeleton, but cannot be used to fill in gaps. Wild bones (H) are made of grey Dinosaur Bones and take on the properties of whatever bone they touch. This allows the player to use them to fill in the gaps that might exist due to missing Dinosaur Bone colors. After each player has had a chance to build their dinosaur skeleton, the Player screens are removed and the next phase of the game begins. Players now score their dinosaur skeletons. Each of the 5 Museum Categories will be scored once with the value the Promotion cube is on indicating the points to be won. The player with the highest number of points in a specific category receives the points. The second highest receives the points one space lower than the space the Promotion cube is currently occupying, and so on. Size: each player counts the Dinosaur Bones that form their skeleton’s Ribs. Length: each player counts the Dinosaur Bones that form their skeleton’s Spine and Tail. Height: each player counts the Dinosaur Bones that form their skeleton’s LONGEST Limb and Neck. Ferocity: each player counts the Dinosaur Bones that form their skeleton’s SHORTEST Limb and Head. Unique: each player counts the Unique Dinosaur Bones. If a player has fulfilled a Bonus card, they can reveal it now and collect the points, as well. The player’s should feel free to inspect their opponents’ skeletons to ensure they are correctly built. Especially when they claim to have fulfilled a Bonus card. If found to be accurate, the Bonus card is discarded. All points are recorded using the Score markers and the scoring track. At the end of the round and after all points have been recorded, move the Museum Categories down (2 spaces for round 2, 1 space for round 3) and advance the Round counter. The round is now over and a new round begins. Back to the Badlands! The game ends after the third round is completed. Final scoring now takes place. Each player flips over and adds the values on their Notoriety tokens together. If the player has any Bonus cards not completed, these count as 3 Notoriety points. Players then announce their total Notoriety. The player with the greatest Notoriety subtracts the Notoriety value from their score. All other players ADD their Notoriety to their score. The winner is the player with the most points in the game. Two game variants are available to play. Each are summarized here. This 2-player variant is a bit more cutthroat when it comes to scoring, but plays more or less like the standard game. The biggest change is the scoring of completed dinosaur skeletons and the Notoriety at the end of the game. Instead of the player with the most Notoriety subtracting their total Notoriety score from their overall score, they subtract the difference between the two values. If a more “family friendly” version of the game is what you need, flip the Player Reference boards over and use the “family” side during the game playing session. The Notoriety actions have been removed, but players can still use the Bonus cards if they want to. A new action has been added to fill in for the missing Notoriety actions. “Survey” Standard action allows the player to move their Player pawn one additional time per turn during the first phase of the game. 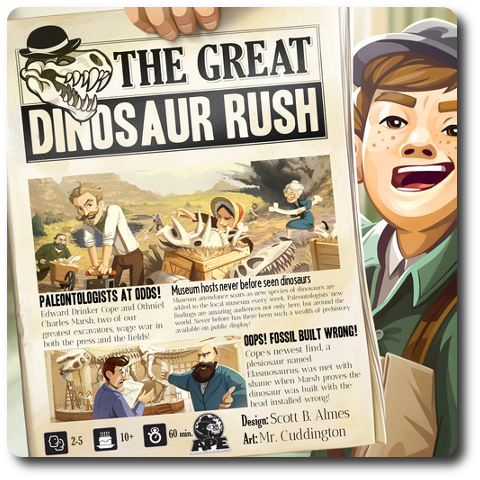 To learn more about The Great Dinosaur Rush, visit the game publisher’s website. The Child Geeks didn’t think much of the game until they learned that they would be building a dinosaur skeleton. Even more exciting for them was the freedom to create the skeleton however they chose, with limitations of course. According to one Child Geek, “This is the perfect game for me! I love dinosaurs and I love looking at their skeletons at the museum. Now I can create my own!” Another Child Geek said, “I had no idea scientist could be so mean to each other, but I guess you have to be nasty sometimes if you are going to create something awesome.” Not sure if that is a lesson I want the Child Geeks to learn, but within the context of the game, it’s spot on. 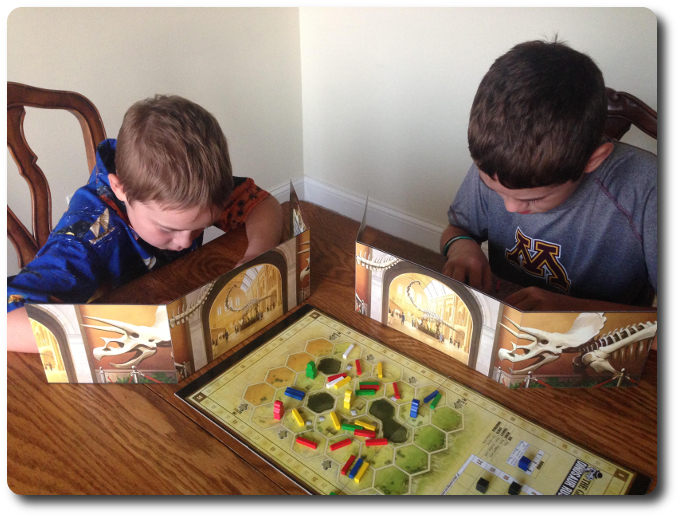 While the Child Geeks had no problems with the rules, they struggled in two particular areas. The first was collecting Dinosaur Bones. They wanted to collect more bones at a faster rate, but were unable to. This caused some frustration. Second, building a dinosaur skeleton is not as easy as it first sounds. The rules that dictate how the bones can be connected are clear, but limit a player’s creativity at first. This also frustrated the Child Geeks. As one Child Geek put it, “The only thing about this game I do not like is the inability to get more bones.” When all the games were over, the Child Geeks didn’t let their frustration get them down and decided to approve The Great Dinosaur Rush. The Parent Geeks were very intrigued by the game. According to one Parent Geek, “Most of this game doesn’t look that interesting or new. I just move my meeple around and collect stuff. What I really like is that I get to build a dinosaur!” Another Parent Geek said, “This game reminded me why I liked dinosaurs so much as a kid. It was a lot of fun to build those that I remembered and those that I only dreamed of.” Like the Child Geeks, the Parent Geeks were at first frustrated with their lack of bones and the short amount of time provided to collect them. Unlike the Child Geeks, they had no problems with the rules that dictated how the bones could be connected. When the last bones were put in place, the Parent Geeks all agreed that The Great Dinosaur Rush was a game that promoted critical thinking, logical problem solving, and imagination resulting in some very cool looking dinosaur skeletons. The Gamer Geeks were initially very displeased with the game’s rules that severely limited the collection of Dinosaur Bones quickly and in bulk. According to one Gamer Geek, “I don’t understand why the game is so restrictive at first if the idea is to collect dinosaur bones. With only 3 rounds to collect bones, you can hardly get enough to build what you want.” And that there, folks, is an important idea to get your mind around. Players will not be able to sit down and build a specific dinosaur right away. The bones are random and there isn’t much time to collect them. Instead, a player must ask themselves, “What do I have to work with?” If they can do that, they’ll be in a better position to win. Flexibility and creativity is key. The Gamer Geeks quickly caught on and their attitude towards the game became considerably more cheerful. According to one Gamer Geek, “Once you understand the rules, the most important part of the game is the building of the dinosaur skeleton, which is a lot of fun.” The Gamer Geeks found The Great Dinosaur Rush to be a fun mix of conflict, discovery, and creation that resulted in an enjoyable game, although they all agreed it was over way too soon. The Gamer Geeks voted to approved The Great Dinosaur Rush. The biggest complaint we heard from all our groups focused around not being able to collect the right Dinosaur Bones. Turns out that 3 rounds of game play is simply not enough for some players. This is primarily due to a player’s drive to create the biggest and best dinosaur skeleton so they can to win all the points. But that is near impossible. All a player can do is create the best dinosaur skeleton they can given the bones they currently have. Your first skeleton will be little more than a prehistoric chicken. Which isn’t much to get excited about. But through careful planning, logical thinking, crafty maneuvering, and dirty dealings, a player can acquire enough Dinosaur Bones to create a fantastic creation by the time the game is over. Do not be mislead, however. The goal is not to create the biggest skeleton, but simply the best based on the Museum Categories that will change during the game. Players should focus their skeleton builds to the museum’s needs and their Bonus cards if they are to win. A player can quickly hurt themselves if they start looking to collect specific pieces too early in the game. What they really need to do is create a solid base of options for the final push at the end of the third round. I very much enjoyed the game and found the Bonus cards and the Notoriety tokens to be the most interesting aspects of the game that were overlooked by many players. The Bonus cards reminded me of the Destination cards in Ticket to Ride. Both cards provide direction if the player needs it, a bonus if they achieve it, and a penalty if they do not. There were a number of times during the game that I didn’t know what to do with the Dinosaur Bones I had, but the Bonus card gave me a good start and a goal. The Notoriety tokens are like a cursed currency of sorts. You are damned if you do and damned if you don’t take them. The real challenge is collecting just enough to have 1 less Notoriety token then the player who has the most. This is the ultimate coup, as you let the player ahead of you take a tremendous fall while you are elevated above and beyond. Truly, fame and infamy are two sides of the same coin. Overall, I am most pleased with The Great Dinosaur Rush. It’s a game my players keep talking about and gives everyone an opportunity to build dinosaur skeletons both realistic and fantastic. Heck, they can even mix and match. If you enjoy games where creativity and critical thinking are blended together, where an opponent is but one more aspect of the game to manipulate, and dinosaurs, then do sit down and play The Great Dinosaur Rush. Tagged Animal Games, Child Geek Approved, Father Geek Approved, Gamer Geek Approved, Parent Geek Approved, Prepublished Games. Bookmark the permalink.